Faux, or fake, lighthouses are not and have not been working lighthouses. They are often miniatures of actual lighthouses. Many are attached to restaurants with nautical themes, are used as Bed & Breakfasts or serve as a pieces of art as would a sculpture. St. Joseph Bay was originally a federal lighthouse but is now a private residence. As such we felt it best not to list it with the Florida lighthouses since it is not eligible for grants from the FLA. Built in 1902, St. Joseph Bay was designed so the keeper and his family could live directly in the lighthouse. It was built on brick columns allowing for the cistern and supplies beneath the house. During World War II the lower area was enclosed providing sleeping quarters for the Coast Guard beach patrol. the ground, and used as a residence. Later it became a barn. During the move the lamphouse had to be removed to clear some utility lines. The crane used to remove the lamphouse proved to be inadequate for the job, and the lamphouse was dropped, completely destroying it. 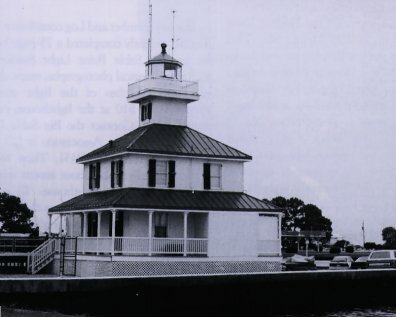 In 1979 the lighthouse was purchased by Port St. Joe resident Danny Raffield and moved thirteen miles to it's present location. 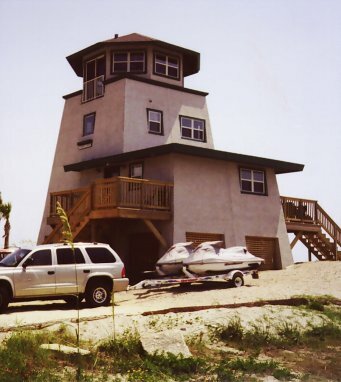 Danny has meticulously restored the lighthouse keeping true to it's original design, with the exception of the addition of a large porch on the rear facing the water. He recently installed a new lamphouse so now St. Joseph Bay again looks like a lighthouse. We salute Danny Raffield for the loving restoration work he has done. As a private residence, the lighthouse is not open to public tours, but it can be viewed from the road. It is located south of Port St. Joe on county road 30 just south of Route 98. The next two lighthouses listed here are active, registered lighthouses, but were built and are maintained with private funds, receiving no federal funding. They are registered as private aids to navigation. 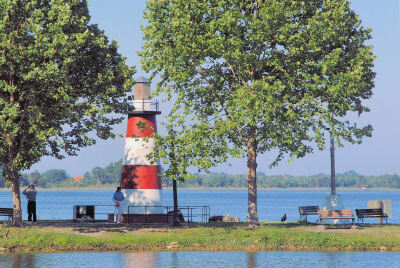 The Mount Dora Lighthouse is located on Lake Dora north of Orlando. 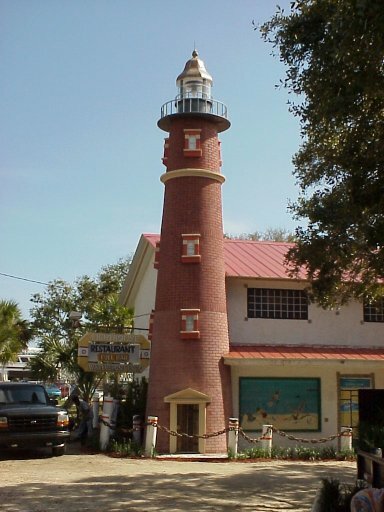 Though considered by many to be a faux lighthouse, it is registered as an inland aid to navigation, the only one in Florida. The lighthouse was built in 1988 at a cost of $3,000 raised by local civic groups. 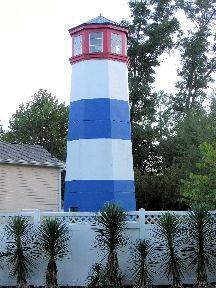 It is 35 feet tall with a flashing red light, and a day mark of alternating red and white strips with a white hexagonal lantern. 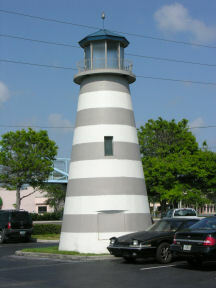 The Tierra Verde is Florida's newest lighthouse, entering service in November of 2005. The Lighthouse was built by Tampa Bay Watch, Inc. Established in 1993, this is a nonprofit stewardship program dedicated to protecting and restoring the marine and wetland environments of the Tampa Bay estuary. The organization is responsible for conducting numerous habitat restoration and protection activities throughout the year. 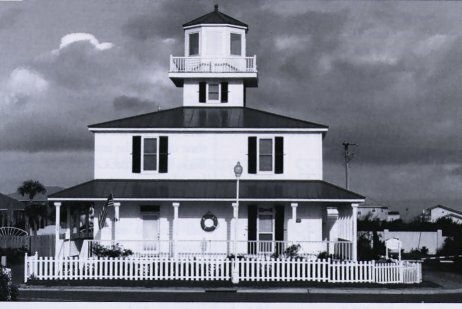 In order to continue to support their goals, the group constructed a marine center and educational facility on Tampa Bay to resemble the Boca Grande Lighthouse. The US Coast Guard got involved in the project and installed an optic that is classified as an active aid to navigation. The lantern room is not accessible for climbing. Below are a group of Bed and Breakfasts (B&Bs), Resorts, Rentals and Restaurants in Florida that are constructed to resemble a Lighthouse. 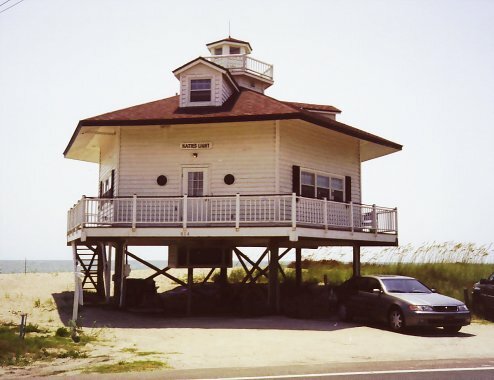 On Amelia Island, there are two beachside lighthouses available for rent. Up-to-date rental information is available through a web search. Green’s Light is lighthouse-styled and located beach side on A-1-A. e.
Katie’s Light is Chesapeake-styled and located beach side on A-1-A. . This faux light is located in the Harbor Cove Apartments Homes development in Gainesville and is visible from the Southbound lane of Interstate 75. The photo was submitted by Gabriel Brooks of Gainesville. The Villages is a large retirement community in Central Florida. 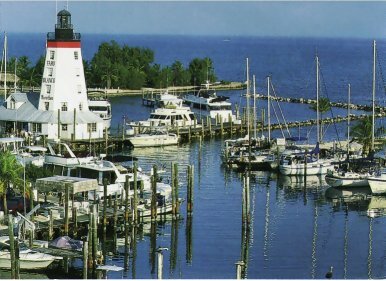 Even though they are located 40 miles from the nearest beach they have a very active lighthouse club and are supporters of the Florida Lighthouse Association, They not only have a lighthouse club, but they also have this beautiful lighthouse on Lake Sumpter at Lighthouse Point Landing. At St. Johns Pass Village at Madiera Beach near St. Petersburg, a "faux" lighthouse serves as the centerpiece for a shopping area complete with boardwalk, seafood restaurants, and some forty shops. This decorative lighthouse overlooks the St. Johns Pass on the inside of the pass that leads into the Gulf of Mexico. Located in the parking lot of the Lighthouse Point Center on the far North side of St. Petersburg, at Tyrone Blvd and Park Avenue. There is an Outback Steakhouse and a Corned Beef Corner located at the center. 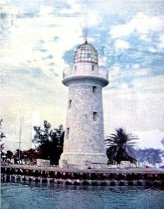 About 1940, the 65-foot tall Boca Chita Lighthouse was built by Mark Honeywell, heir to the Honeywell Instruments Corporation as a private lighthouse to help his yacht find his hideaway on Boca Chita Key. However, the Bureau of Lighthouses felt the light was confusing to navigators, and Mr. Honeywell was ordered to turn it off. Today, it is a prominent landmark for boaters in the Biscayne National Underwater Park. According to the National Park Service website, the lighthouse is open to visitors when a Ranger is on duty. The Whale Harbor Inn and Marina boasts a restaurant with a "World Famous Seafood Buffet." It is located at mile marker 83.5 in Islamorada just south of Plantation Key. It’s coral-rock, rubble-stone constructed tower has been a landmark for years. 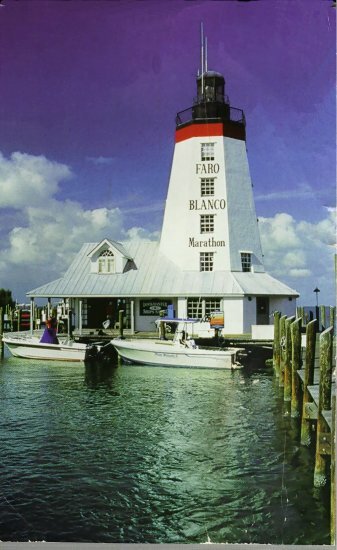 Faro Blanco (Spanish for "White Lighthouse") is a large replica lighthouse. It is a 50-foot lighthouse replica built in the 1950's as an aid to navigation to the local marina. Today, it also serves as a landmark for the Faro Blanco Resort. Sharp eyed lighthouse explorers patrolling the Panhandle may come across a familiar "lighthouse" in the Santa Rosa Beach area near Grayton Beach State Park. The site, off Route 30A via Route 98, is west of colorful Seaside and 20 miles east of Destin. The lighthouse is a replica of New Orleans’ 1892 New Canal Lighthouse, only it is larger and nicer. The two story structure, built in 1998, houses five bedrooms, each with its own bathroom. It has high ceilings and wood interior trim in the tradition of old lighthouses but has all the modern amenities, including a spacious, modern kitchen-dining area. A spiral stairway leads to the lantern room where a transplanted, playful "spirit" interacts with visitors. It may be rented by you and a flotilla of your favorite friends. The Old Beach Road lighthouse is operated by FLA members Sue and Brian McCabe. It was featured in photographs in the Fall, 1998, issue of The Keeper’s Log. If you are looking for a special vacation get-away in northwest Florida, we heartily recommend it.